When Abbott and Costello don’t give you snickers, Boris Karloff doesn’t give you chills, and Universal doesn’t give you a good monster movie you know you’re in for trouble. After the greatness of Abbott and Costello Meet the Invisible Man, the “Abbott and Costello Meet the Monsters” series took a nosedive. Not only that, but with Abbott and Costello Meet Dr. Jekyll and Mr. Hyde (1953), it slipped on a rotten banana peel while on roller skates and belly flopped into a pool full of elephant poo. Bud Abbott and Lou Costello play Slim and Tubby (creative names aren’t they?) who are two American cops stationed in Victorian London so they can learn a thing or two from Scotland Yard. A monster that is killing prominent members of society is stalking London. The monster is none other than the nefarious Mr. Hyde, the alter ego of the well-known Dr. Jekyll (Boris Karloff). Jekyll is infatuated with his young ward Vicky (Helen Westcott). You know, sort of like Batman and Robin. To the dismay of the good doctor, Vicky is really in love with annoying reporter Bruce Adams (Craig Stevens). Of, course Jekyll vows revenge and transforms into his lesser half to kill all those who stand in his way. Along the way Slim and Tubby get caught up in all this silliness and get on the track of Jekyll and Hyde. The film’s ending is actually kind of funny, but it’s too little too late. 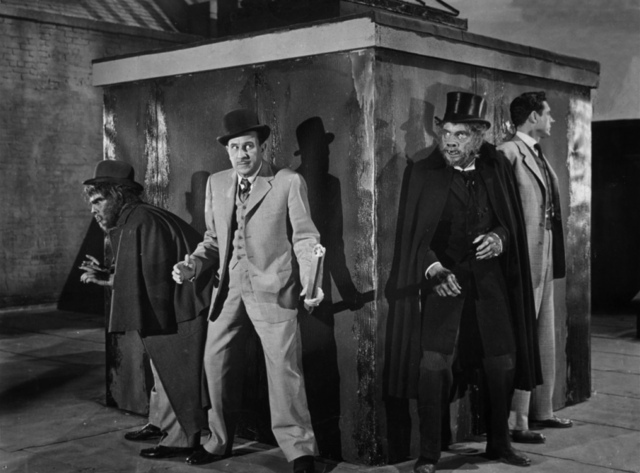 Abbott and Costello Meet Dr. Jekyll and Mr. Hyde ranks alongside The Mummy’s Curse and The Creature Walks Among Us as one of Universal’s worst monster movies. The ending is funny and there are one or two good fright scenes, but the rest is garbage. None of the inventive visual humor from the first two Abbott and Costello Meet… is present. There is a scene involving a secret passage (a pale retread of the scene from Abbott and Costello Meet Frankenstein) and a moronic attempt at comedy involving Costello transforming into a giant mouse. None of those are funny. Abbott and Costello’s verbal humor is nearly nonexistent in this film. 95% of the humor consists of a) character(s) seeing something frightening and b) the same character(s) running away in a zany manner. Boris Karloff was one of the greatest actors of all time. He has starred in many of the world’s true motion picture classics. He also made many less than stellar films. This guy knew when he was in a piece of crap. He also knew that he could be paid well for doing nothing but what came naturally to him after over twenty years in the horror business. Boris Karloff knew that Abbott and Costello Meet Dr. Jekyll was a real potboiler of film, so he gave a real potboiler of a performance. It had nothing to do with his talent waning; he still had The Raven (1963), Comedy of Terrors, and Targets ahead of him. 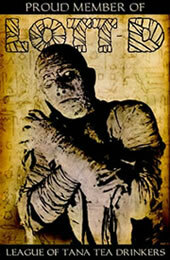 Karloff was a true professional and a true genius and he knew which films he could save his strength in. Karloff, of course did not play Mr. Hyde. The part was way to physical for the 66-year-old actor. Stuntman Eddie Parker stepped into the role. Parker also stood in for Bela Lugosi in Frankenstein Meets the Wolf Man and Lon Chaney Jr. in many of the “Kharis the Mummy” films. Bud Westmore made Parker’s Hyde make-up and it is as uninspired as the rest of the film. A pale imitation of the make-up his brother made for Fredric March in MGM’s classic 1931 version of Dr. Jekyll and Mr. Hyde. Like Abbott, Costello, and Karloff, Westmore’s talent was ill-used. He is one of the greatest make-up men of all time responsible for such great monsters as the Gillman from Creature from the Black Lagoon and the mutant from This Island Earth. Abbott and Costello Meet Dr. Jekyll and Mr. Hyde has the distinction of being the only “Jekyll & Hyde” film that Universal ever made. Jekyll & Hyde was(were) the only classic monster(s) that the studio never filmed during the classic period in the 30’s and 40’s. It’s a shame that when the studio did decide to film the story they made such a stinker. To add insult to injury, they hired two great comics and the greatest horror star of all time. 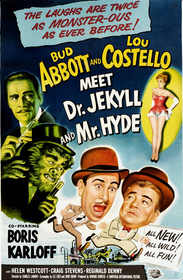 If I could choose one word to sum up Abbott and Costello Meet Dr. Jekyll and Mr. Hyde, it would be waste. It is a waste of two great comics, a waste of one of the screen’s greatest legends, a waste of one of history’s greatest monsters, and a waste of everyone’s time. Submitted by Anonymous (not verified) on Thu, 2010-08-19 16:15. I actually liked this film - I think it was great silly fun. Submitted by Kevin Nickelson on Mon, 2010-11-15 22:57. Good review, Jake. I concur that this film is of the hit-and-miss variety, with more misses than hits. Still, I did enjoy a few moments and Karloff, even while slumming, is still Karloff and always interesting to watch. As much as I like Craig Stevens in his later work as Peter Gunn, his wiseguy reporter is really annoying here. Not sure what Helen Westcott sees in him here. Anyway, good review. Keep it going!